Welcome to F1Minute - Vettel wins the Monaco Grand Prix. Sebastian Vettel added yet another win to his tally this year, making it five of six races but, of course, Monaco threw up all manner of surprises. With a clean first stint, Red Bull called Vettel in early to react to a stop by second place Jenson Button. However, the mechanics weren’t ready and it was slow, promoting Button into the lead. The McLaren driver lost out when the Safety Car came out. Yes, the first appearance of the safety car in 2011 was due to a collision between Lewis Hamilton and Felipe Massa, with the Ferrari knocked out of the race. Differing strategies allowed Vettel back into the lead, but neither Button nor Fernando Alonso were going to let him run away with it. 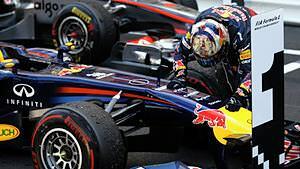 The two of them, on fresher tyres, were chasing Vettel right up until an incident occurred with Alguersuari and Petrov, both crashing into the barriers. The race was red flagged while Petrov was extracted from the car, he’s okay, by the way, and the stoppage allowed Vettel to change his tyres, so that upon the restart, with just six laps to go, it was an easy victory for him.